I'm interested in any swords or daggers that were purchased from Ye Silver Castle Swords over the years. These were sold mainly at Renn Faire's. If you have one that you would be interested in parting with please contact me. Hi. I have a hand and a half sword from Ye Silver Castle that I bought at the Tennesee Renn. Fair 20 years or so ago. It is currently hanging on my wall in a shadow box. I also have a leather scabbard that was made for the sword. If interested let me know, and I'll send you some pictures. The sword has never been used to cut anything, so it is in pristine condition. This co. Must have gone out of business. I cannot find any information on ye silver castle sword makers. I have a broad sword bought in “98” at a medieval festival. Says he paid around $800 for it than. Trying to find it’s worth today. 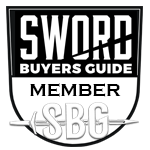 I wonder, if you’re looking to sell out your stock, whether it’s worth creating a thread on the Vendor/Manufacturer section and list the blade types you’ve got available and the sort of cash you’re looking for for each blade. Doesn’t need to include pictures if you don’t have any.